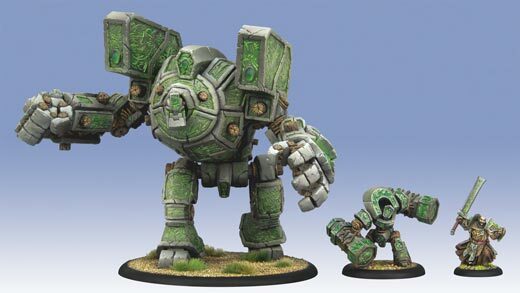 3 for Intelligence: Woldwrath up on Privateer press! This thing is freaking huge!!! So far I have been really impressed by the modelling team at privateer press. They continue to pump out awesome figures. I just would really like Archangel to be previewed already... C'MON!!! Friendly faction models gain an additional die on magic attack rolls targeting enemy models within 10" of this model. All I'm saying is... Why can't Legion get some of that??? That's freaking awesome!! I'm not super familiar with circle, but this seems like a good 'build around me' piece. 56 boxes in the health spiral... 56! Holy crap. Too bad he's a construct and can't be healed though. Spell Ward: It can't be targeted by spells. Friendly or enemy. So it will still take blast damage from a spell if one lands near it, but you certainly can't drop it on this guys head! This also means that he can't be directly targeted by buffs, but group buffs should still work on him. This guy seems pretty boss. My buddy was saying that he might not necessarily fit into circle's play style... but if that's the case, this may open a new play style for them!